So the next annual Call of Duty is coming out this November 4th, I am locked in to the series so would have brought it anyway but news of Infinity Ward creating their own version of Zombies (the popular extra mode in the Treyarch developed Black Ops games). It proves just how popular this mode is as previously Sledgehammer Games also made an extra mode with the undead in it (Call of Duty: Advanced Warfare's Exo Zombies). So the other day the first trailer for this version of Zombies was released, in Infinite Warfare it is to be called Zombies in Spaceland (or least that's the name of this particular map), this is set in the 1980's and looks to take on a more light hearted approach. The set up for it is that four actors (played by Seth Green, Ike Barinholtz, Jay Pharoah and Sasheer Zamata) are tricked by a horror director (voiced by Paul Reubens) and transported straight into a zombie film that is set in a space-themed amusement park. Here they have to survive against waves of zombies as is the norm. Also on board is David Hasselhoff as a resident D.J. From the trailer (included below) things look to be 'zany' then the more serious Black Ops Zombies, it seems to be the usual assortment of guns, as well as special weapons, level based traps and barricades to keep up. For example there is a boom box which attracts zombies, only to then explode, much like the monkey bombs. There is also a dance floor at one point where lasers from a disco ball start slicing up the undead. I am not a hundred percent sure but I get a feeling the game is going to be full of licensed music from the eighties, at least in the menu screens. I have watched a bit of the developers speaking about this mode, apparently one new thing is that when you die in the game you end up in an 'Afterlife Arcade' where you can play mini games in order to earn the right to get back into the game. I am very pleased a new Zombies exists but I do have some small concerns. 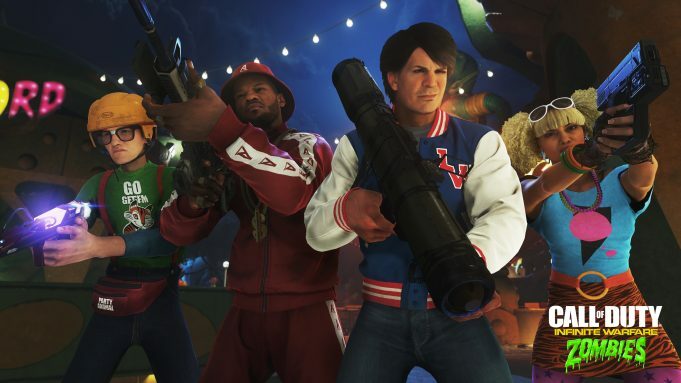 Firstly I am unsure of the tonal shift, the main four characters in particular seem like they are going to be annoying, while the bright colours and comedy weapons also are not ideal for making a scary game. On the plus side there are windows to board up, the zombies look pretty awesome (including the usual super zombies and even zombie clowns! ), and there are going to be the equivalent of gobble gums and perk-a-cola's (cards and candies I believe). Anyway check out the trailer below, I look forward to getting to play this.